Pollution is rampant in our times. Particularly in Southeast Asia with it's economic boom and the low (or often: not existing) environmental standards. There are many different kinds of pollutions and pollutants. One of which it's less known even being a pollutant is dust. Dust consists of small particles of the most different kinds. They are smaller than 10 micrometer, some are as small as being measured in nanometers (ultrafine particles) - no more to see with the bare eye. Generally spoken, as smaller a particle is, as more dangerous it is for the health of a living being. For humans and animals it's so that bigger particles can be physically absorbed, but very small ones penetrate the lungs deeply. The level of danger is also dependent on the shape, better the surface of the particles. Some are much more dangerous than others. So does soot for example consists of a very dangerous variety of fine dust particles (fine particulate). A heavy or longer lasting impact of fine particulate can cause serious diseases, from caughing up to pneumoconiosis and cancer. In Germany the populations life expectancy is in average reduced by ten month due to it. 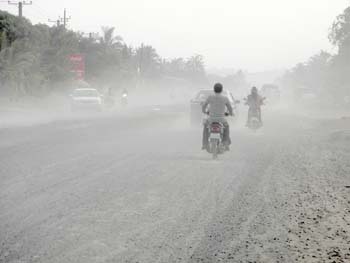 According to the European Commission there are annually 310,000 people in the EU dying untimely due to dust pollution. In Southeast Asia the number will doubtlessly be much higher. There is no harmless concentration for fine dust - it's always harmful, and it's harm increases by the degree of concentration and the time of exposure to it. A single truck is causing an enormous amount of dust on a dirt road. Coming in such a haze one get's a high dose of fine particulate; besides the clothes are immediately ready for the laundry. The dust cloud whirls meters up and is transported by the wind over many kilometers. The worst fate suffer the people who live at the sides of such roads - they are under a permanent impact of heavy dust pollution. As faster a vehicle goes, as more dust it whirls up. Since time pressure is unknown for Orientals, there is another reason for fast driving: it's fun. The most roads in Cambodia are still dirt roads, often even inside towns and cities. Nevertheless is the traffic increasing. 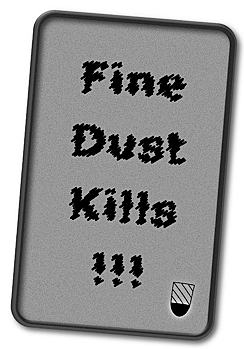 Dust and fine dust is the result of natural and man-made causes. So is erosion of rocks and stones by wind and water a natural cause, as plant pollen, microorganisms like bacterias, volcanic eruptions or forest fires are. Even seawater spray counts as fine dust, but it's not a dangerous form because it's solvable with water. On the contrary, it's healthy and a time spent in a seaside ressort can be a therapy for the lungs. Man-made sources of dust are the industries, traffic, private households with their burnings and the agriculture (animal husbandry and field tilling). They make the lions-share of the dust emission in general. One of the main dust sources in Southeast Asia's dry season seems to be traffic, particularly on dirt roads. Cambodia, as a country with a very low developed infrastructure, has an extremely high impact of dust pollution. In my eyes it gives the worst example of the problem for whole Southeast Asia. Tyre, break and asphalt abrasion of vehicles is seldom counted but accumulates to a great amount (tyre abrasion in Germany e.g. accumulates up to 60,000 tons per year, 10% of it is fine dust) in total. Break abrasion is among the very dangerous kinds of fine particulate. Here in Southeast Asia the so much beloved fireworks let the finedust impact increase literally explosively. Fireworks are done at many occasions all over the year. Indoors are smoking, laser computer printers or copy machines, cooking activities, vaccuum cleaners without filters and candles some significant sources of fine dust. Emissions around 2,000,000,000 particles per printed page by a laser printer are no exception. Since there are regulations about fine dust emission limits in Europe (pretty weak ones) and the USA (even weaker), there is certainly nothing like that in Southeast Asian countries. Besides, emission of dust is one thing, but it's only dangerous for humans, animals and plants when it get's whirled up. Traffic is one of the worst thrivers for that. Dust is part of air pollution and responsible for a number of diseases. Fine dust and ultrafine dust is entering the lungs and it takes the body a long time to remedy from it. Among the consequences are allergies, asthma, heart diseases, heart attacks, diseases of the blood circulation system, lung cancer and more. When we breathe in the particles they get accelerated. The very small particles encounter the body cells in the mouth, the throat and the lungs. Being small and 'aggressively' shaped in their surface, they can penetrate the cell membrans and crash with the cell core, namely the DNA sequence. The crash can lead either to a destruction of the DNA and the death of the cell or it can alter the DNA sequence. An alteration of the DNA can cause a cancer cell which reproduces itself uncontrolled. If that appears in a great amount, the immune system might be overcharged and cancer spreads out. The highest concentrations of dust and fine dust appear closest to the ground. Children and animals are therefore in a higher danger than adults, because they are smaller and get therefore a higher impact (that's the same with traffic exhaust fumes in general). Fine and ultrafine particles are able to penetrate into the blood circulation and are transported through the whole body. Toxical substances as mercury, lead and others do accummulate in the body and cause nervous diseases. Interferences between fine dust pollution and brain functions are supposed. Research on this field is ongoing. It's also supposed that fine dust pollution leads to a smaller birth weight of newborns. Unfortunately there is often not much to do against the pollutions we are exposed to. It's after all often a social matter, and our socioeconomic system has little interest in solving problems. Exept it proves profitable. In the case of dust pollution many people in Southeast Asia use a medical face mask. It helps a bit, but much, particularly the smaller particles, penetrate the mask. It's always recommended by the authorities not to move more than possible. But to remain healthy we do have to move and do physical exercises. In a region with heavy dust pollution sports is not only healthy but has a very negative side effect. 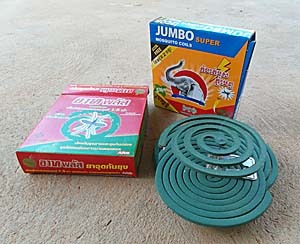 The authorities sometimes (an example from Phnom Penh) recommend that the victims shouldn't breath in deeply. I don't comment that. Ironically the ones who cause the most dust, car drivers and drivers of other vehicles, are, so long they stay in their vehicles, best protected. Indoors one can care for cleanliness, means removing the accumulating dust. No smoking, no mosquito coils, keeping the windows closed and the floor and all surfaces clean helps. Whirled-up dust is transported by air streams. Wind can transport dust over thousands of kilometers, over country borders and to other continents. As smaller the particles are, as slower they lower to the ground. Very small wind circulations whirl them up again. The smallest ultrafine particles are the most frequent particles in dust. Desert storms are among the most powerful natural dustblowers. The best air cleaner is a longer rain. The water binds the particles and flushes them out of the air. 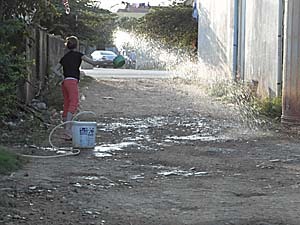 Dust pollution, at least outdoors, ist mostly a phenomenon in the dry season. Though, man-made pollutions as exhaust fume, cigarette smoke, industrial smog and others appear all the time new.